Haslett played defensive end and linebacker in college and set school season records for sacks (20) and fumble recoveries (5). A three-time Little All-American, he appeared in the Blue-Gray All-Star Game following the 1978 season and was chosen by the Bills in the second round of the 1979 NFL draft despite his coming out of a small school. Benefiting from top draft pick Tom Cousineau’s decision to play in the CFL instead, Haslett moved directly into the starting lineup at left inside linebacker. Bills went 7-9 to finish fourth in the AFC East. The Buffalo defense topped the NFL in 1980 and Haslett continued to be a key player, especially against the run. 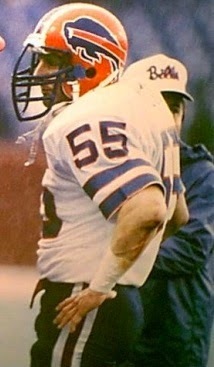 Injuries became a factor as the unit went into decline and Haslett himself was limited to five games in 1983, but he continued to be a steady performer who regularly was among the team’s leaders in tackles. A broken leg suffered in Buffalo’s final preseason game cost him the ’86 season and, while he saw some action with the Jets in 1987, his career was effectively finished. Overall, he appeared in 94 games over eight seasons, and started 86 of them. He went on to a coaching career that included head coaching stints with the New Orleans Saints and St. Louis Rams (interim) in the NFL and the Florida Tuskers of the United Football League.